Would you like your children to grow up in the shadow of a member of An Garda Síochana in full body armor and armed with machine guns? Or maybe in full view of a man being gunned down in retribution of another’s untimely end. The community of the North Inner City has come together to say enough is enough. Dublin’s North Inner City community networks came together to discuss possible actions to deal with the growing rate of criminal fatalities and the open dealing of illicit substances (to name but a few of the variety of terminal issues facing the people of the North Inner City). Below is the outcome of that meeting and links to the articles published after the meeting. On behalf of the community networks in Dublin’s North Inner City, we would like to thank all those who attended the very lively and successful press conference that took place today Friday 29th April at 9.30am in Killarney Court, Dublin 1. The Press conference was called to highlight the need for Government action to address the serious anti-community violence and drug crime that is afflicting this community, including its causes, the entrenched and intergenerational poverty, inequality and social exclusion. 1. A call to the Minister of Justice to meet with representatives from the community to demand meaningful actions from government to address the current serious violence and drug dealing in the North Inner city. 2. Organise an inclusive community peaceful procession and vigil to allow the community come together to support each other. 3. Continue to galvanise support within the community inclusive of residents, local community services & project and the local politicians to maintain pressure on the Government to put in place the lasting measures that will address the entrenched inequalities and poverty and break the cycle of violence, addiction and drug dealing that is so damaging to the community. Thank you again for your support and we will keep you informed as things develop. HOPE features in this article about the abuse of prescription medication (a.k.a., tablets), (i.e., “yellows, blueys, and zimmos”) in this community. HOPE is here to help anybody free themselves from addiction. 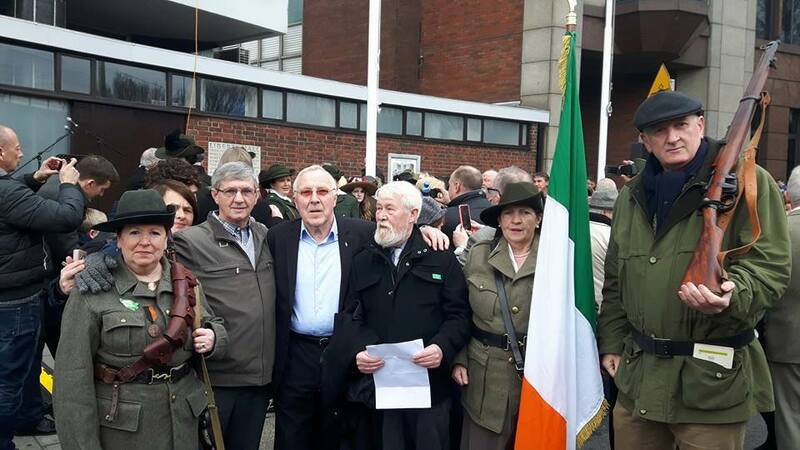 As part of the Centenary celebrations, HOPE participated in three local events, the hoisting of the flag at Liberty Hall on Palm Sunday (20th March 2016), then on Easter Monday (28th March) the unveiling of a plaque on Seán MacDermott Street, and the laying of a wreath at the GPO. 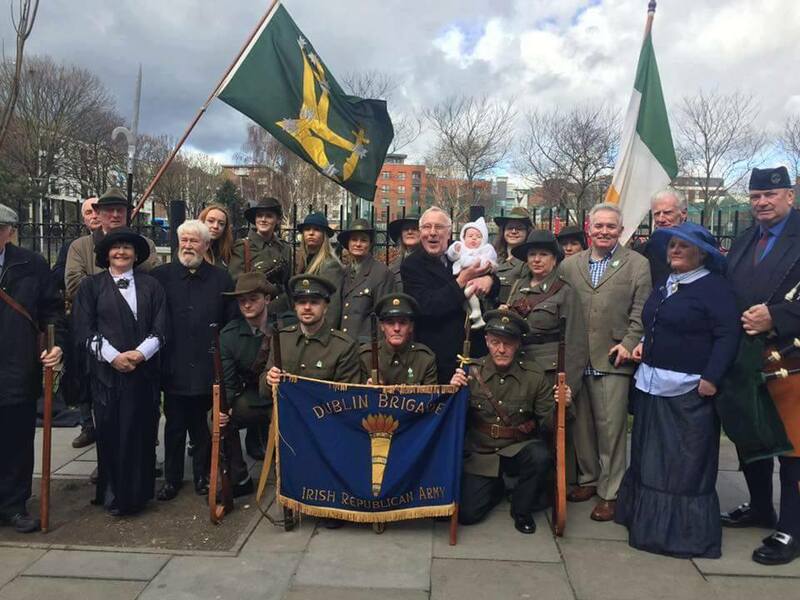 Local historian, Terry Fagan joins us in writing about the community’s commemoration of the 1916 Easter Rising Centenary. Terry’s ‘North Inner City Folklore Project’ has been involved in these community events for over 20 years. Terry also offers historical walking tours of the North Inner City. At the centre of Terry’s tour is tenement life in the north inner city, with a particular focus on ‘The Monto’, old Dublin’s infamous red light district. However discussions with Terry are not limited to tenement life in the latter half of the 20th Century, other topics range from the ‘1913 Lockout’, the ‘1916 Rising’, the ‘War of Independence’ to the ‘Civil War’. The Liberty Hall ceremony on Palm Sunday (20th March 2016) was a reenactment of the raising of the flag. 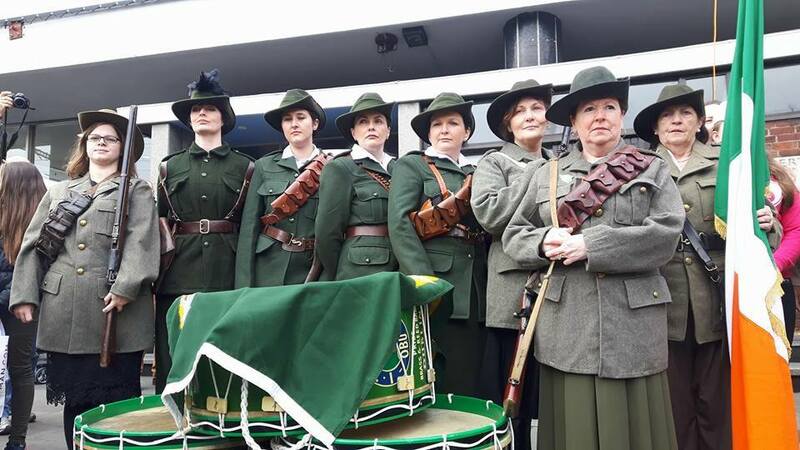 The flag was hoisted on Palm Sunday 1916 by a young girl from Gardiner Street named Molly O’Reilly. 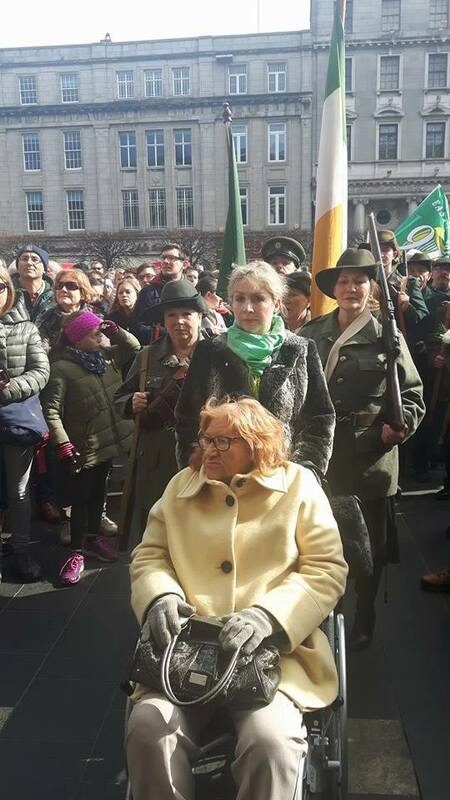 She was given the honour by James Connolly to hoist the flag over the building which he considered the first free part of Ireland. 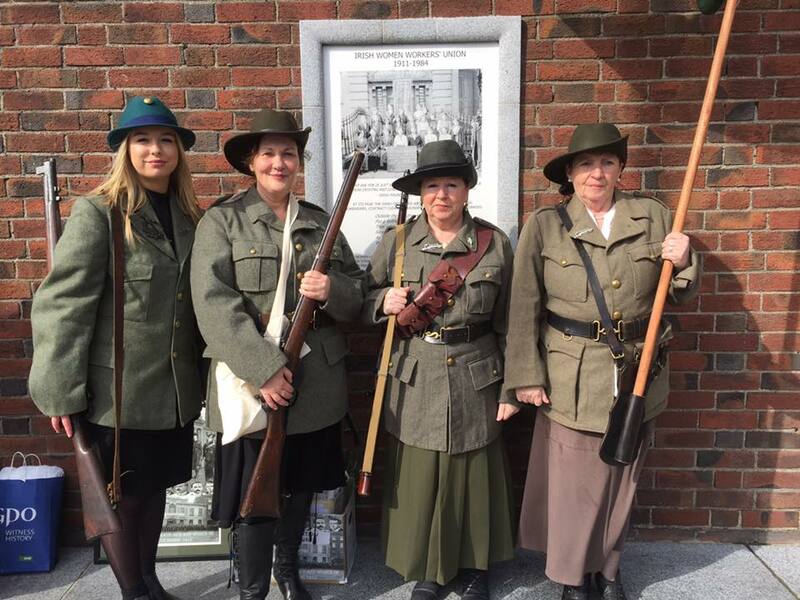 Molly O’Reilly went on to fight in City Hall and was a dispatched courier to the different garrisons around the City during the 1916 Easter Rising. She went on to take a leading role in the War of Independence as an undercover agent, gathering intelligence from Michael Collins’ top team of agents. She supplied the information that played a part in the event in Irish history known as ‘Bloody Sunday’ in 1920. 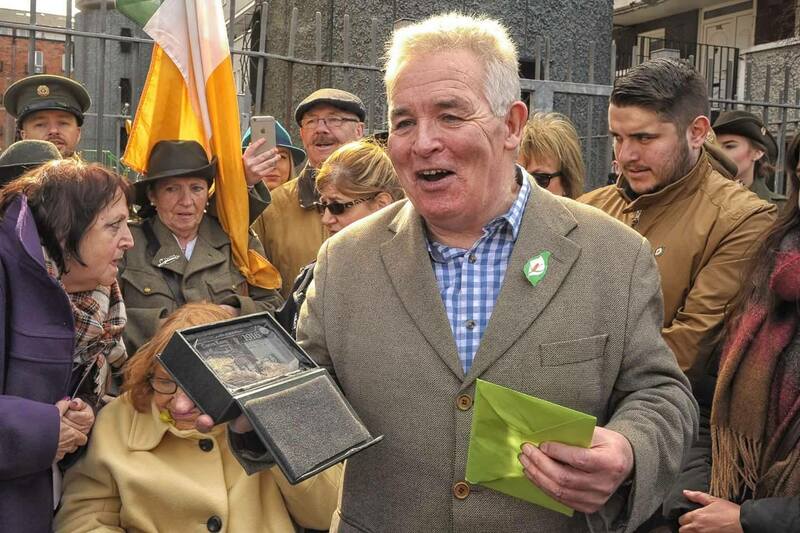 On Easter Monday, 28th of March 2016, the North Inner City Folklore Project pays tribute to the 1916 leader Seán MacDermott with a plaque on the SVP building on the street named after the leader. At the rear of the building where the plaque was erected was the home of Patrick Heany, composer of the Irish national anthem – Amhrán na bhFiann (the Soldier’s Song). It was composed in his house c.1907. Patrick Heany died in abject poverty in 1911, he never lived to see his song become the battle hymn of the 1916 easter rising. 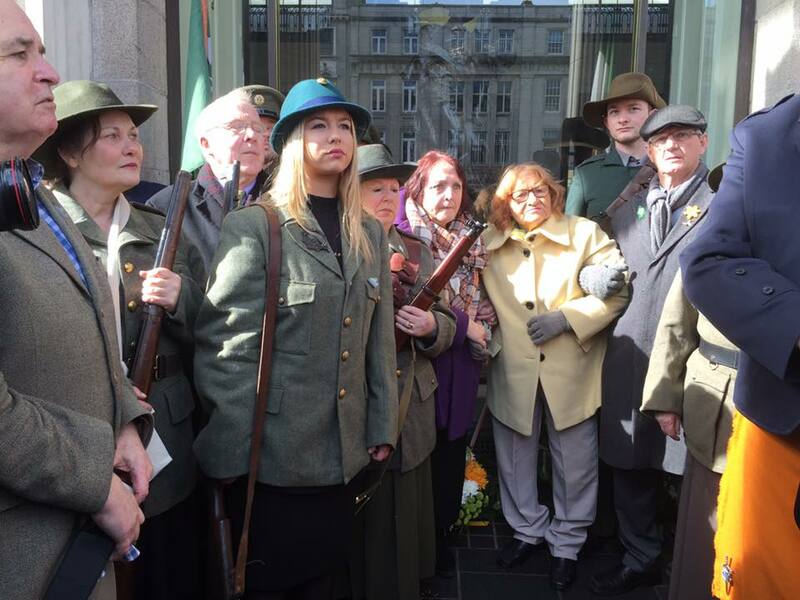 On Easter Monday, Constance Cowley, Daughter of Molly O’Reilly and a relation of the 1916 leader Seán MacDermott, lay a wreath at the GPO. The Proclamation was read out by a local woman named Una Shaw. 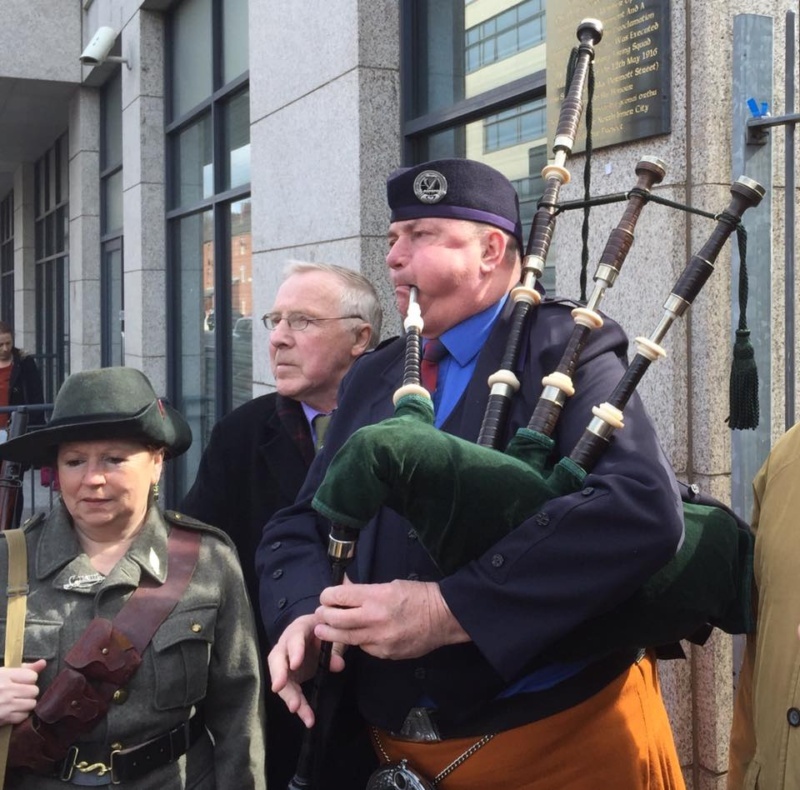 A piper played a lament to the men and women of 1916. 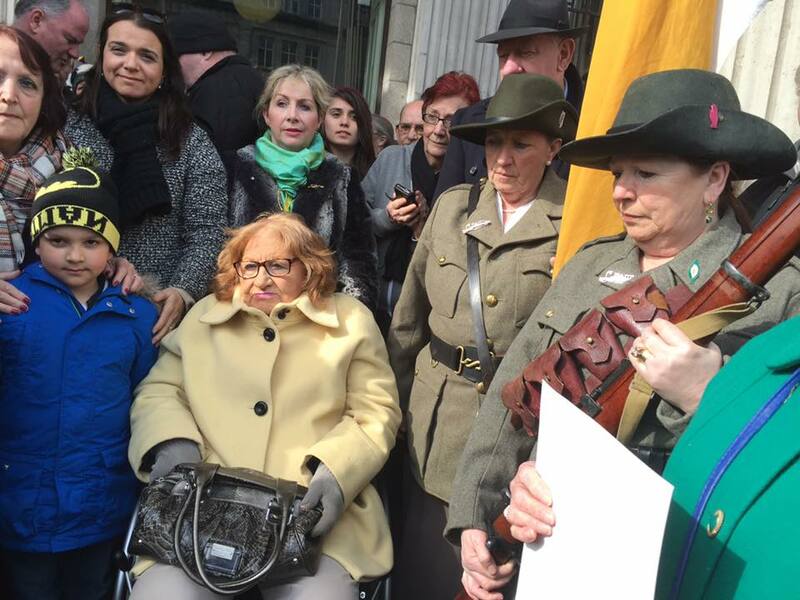 Constance Crowley and the family of Seán MacDermott laying the wreath at the GPO.